After battling the rain the previous Sunday at Mt Stromlo, I looked forward to this activation at Spring Hill. I was encouraged by the contacts made from Mt Stromlo on vhf bands and on 23cm so I wanted to try that again from Spring Hill, which is a few km north of Hall on the Northern edge of the ACT. Access to the site needs to be arranged beforehand. I had texted the owner Phil but had not received a reply so before entering the land I phoned him to check. He said he had seen my text, there was no problem and he wished me a pleasant walk. I think in the past I have spoken to him several days prior to the site visit, then as requested I have texted him to let him know I was on the hill. At the road level there was a very mild breeze, but the further I climbed the higher the wind became. When I reached the point where the track is exposed to the east the wind blew my hat off and continued to rise. At the top it was hard to stand up so I decided to operate from the lee side of the compound where there was some concrete and a steel mesh fence and almost no wind, though the acoustic noise created by the wind on the tower and dishes was quite loud. The vhf and UHF antennas went up first and I made contacts on 50, 144, 432 and 1294 fm. I didn’t make enough contacts on 1294 to qualify the summit but the contact down south to Jayson vk1ja was a good distance and signal levels were quite good. The mobile whip worked well in horizontal mode. 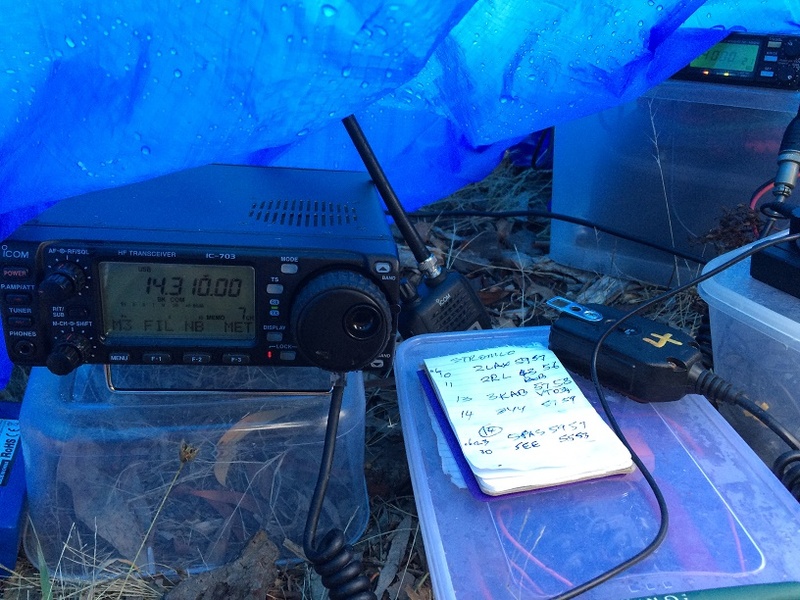 S2S contacts were made on 52, 146 and 439 MHz with Andrew VK1NAM on Mt Majura. For 50/52 MHz I used a wire dipole supported by the squid pole. Later I took that antenna down and set up the 40m antenna to make a handful of contacts before I had to pack up and head back down. I closed down at 8pm 0900 UTC, took about 10mins to pack the gear and arrived back at the car at about 8:50. The track is steep in sections and has many loose rocks, making the downhill walk quite slow and tricky. Anyone planning to walk down in the dark needs a headlamp for safety.